The Hillsborough MPO is dysfunctional and in need of a big housecleaning. The MPO needs new leadership, a new Director and new staff. We posted here that the Hillsborough MPO had already taken sides earlier this year as they began their 2045 long range transportation planning (LRTP). What is the Hillsborough MPO up to now? The MPO excludes the BILLION dollars of new road capacity that was funded in their 2040 Plan. The MPO replaced the term "rail" to "rapid transit system". No one is fooled - it is costly rail. The MPO is using their 2045 survey to push a specific agenda. Scenario planning is not intended to push specific projects. But the MPO is doing exactly that with their 2045 planning process. Here are the MPO's 2045 planning three scenarios, obtusely named A, B and C, that those taking their survey are forced to address. This is a total deviation from the MPO's 2040 planning process executed in 2013-2014 by former Director of the MPO Ray Chiarmonte, who left to be the Director of TBARTA in 2015. The 2040 planning scenarios were named "Suburban Dream", "Bustling Metro" and "New Corporate Centers" and specific projects associated with each scenario were not thrust on the public. Beth Alden took over as Director of the MPO when Chiarmonte left in 2015. This planning mess is all on her watch. 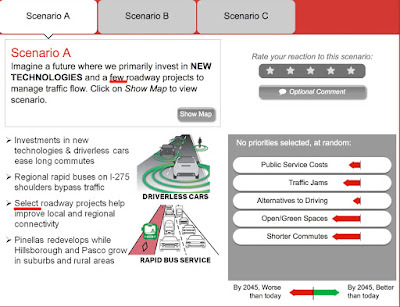 Scenario A provides for only a "few"and "select" road projects. Really? It leaves out the billion dollar plus of new road capacity needs that were identified in the 2040 plan 4 years ago in 2014. 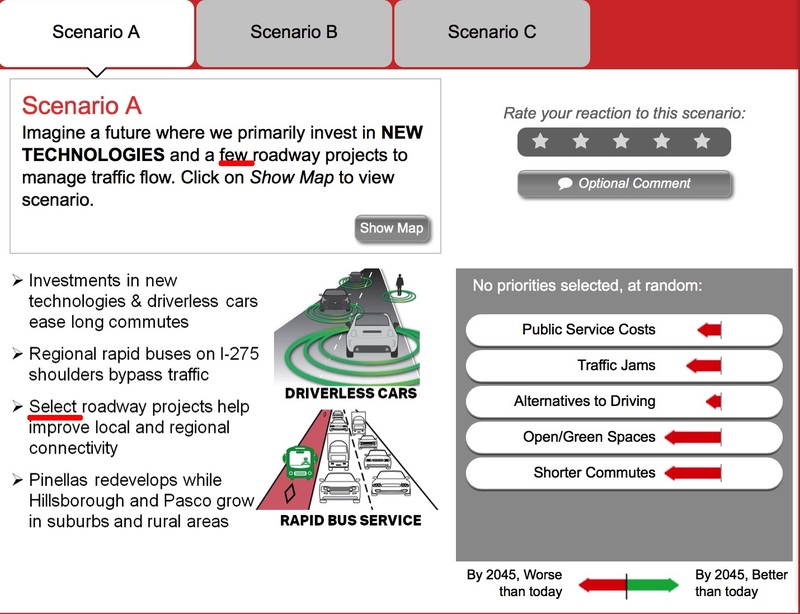 Scenario B only addresses interstates and some select few expressway interchanges. 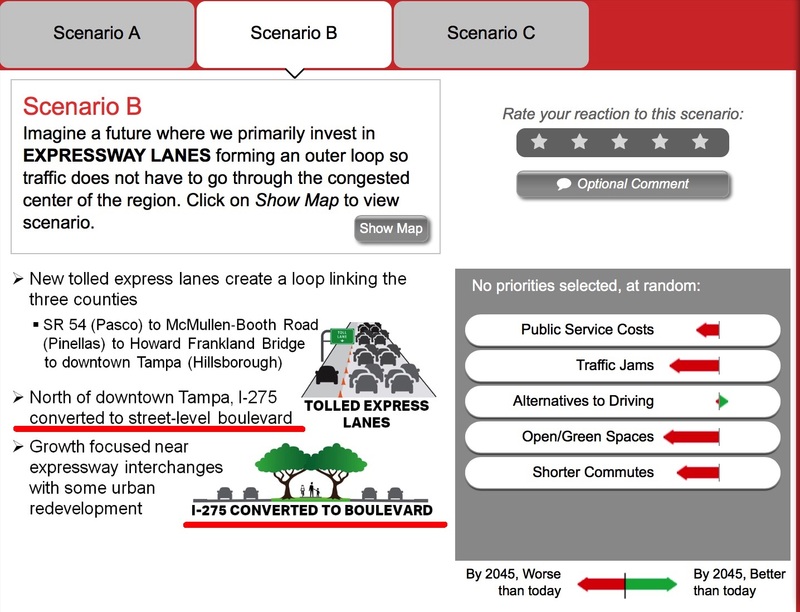 Scenario B includes the absurd specific project of tearing down I-275 from downtown to Bearss Ave and converting that 10 miles of interstate to a street level boulevard with a train. I-275 is a major evacuation route that 200K people use everyday. Can the MPO legally propose tearing down a federal interstate? 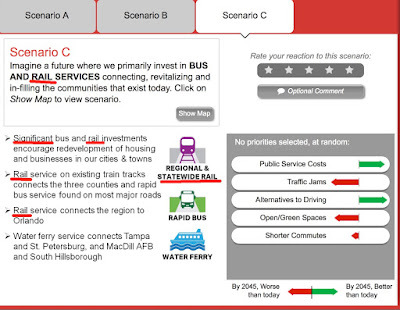 Scenario C is costly rail, rail and more rail. Why does it include Brightline, the privately funded rail service who has stated they want their private rail service to connect Orlando to Tampa? Because of the new proposed baseball stadium with no parking in Ybor city? 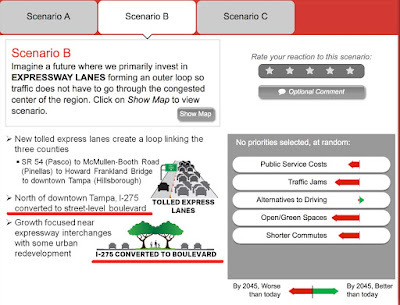 The only way around the MPO's rigged scenarios is to use the comments to bypass their bias. 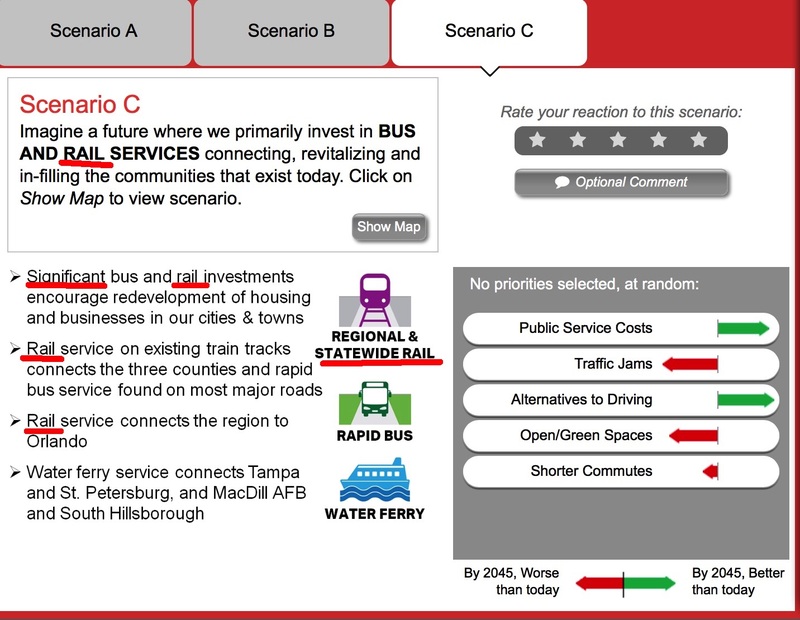 The Hillsborough MPO's 2045 planning process is simply not credible. It appears to be a misuse or abuse of the long range transportation planning process. And now the MPO is desperate. They are now bribing people to take their biased 2045 survey. Who knew the federally mandated taxpayer funded Hillsborough MPO can use "freebies" to bribe people to take their rigged surveys? Surveys that taxpayers are paying for….Did the MPO Board authorize this? Is this legal? Who is part of the MPO's "freebie" bribery? The Tampa Bay Lightning owned by Jeff Vinik. It is Jeff Vinik and his downtown Tampa special interest allies who got the massive 30 year $16 BILLION transit tax on the ballot and are funding the tax hike advocacy campaign. In addition, the 14% transit tax hike would hand the MPO Central Planners gobs of new taxpayer money. The $16 BILLION tax hike hands the Hillsborough MPO central planners $160 MILLION over 30 years. But the MPO's own 2040 Long Range Transportation Plan stated they only needed $16 MILLION over 20 years. How does one get from $16 million over 20 years to $160 million over 30 years? This massive tax hike is a big boondoggle for the MPO central planners wasting gobs of taxpayer money on central planning that the MPO never stated they needed. Do not forget that Janet Scherberger, who works for Joe Lopano as VP of government relations at TIA, is Lopano's alternate on the MPO Board. She sits as a voting member on the MPO Board in Lopano's absence. She is also a Director of Keep Hillsborough Moving, Inc., the nonprofit directly connected to the All for Transportation PAC who got the transit tax hike on the ballot. Scherberger is actively working with the pro rail tax PAC to get the tax hike referendum passed. Who is complicit with who? With the MPO being massively overfunded by the transit tax hike, how was the MPO not included in the performance audit conducted by OPPAGA? There is no coincidence for what is going on. 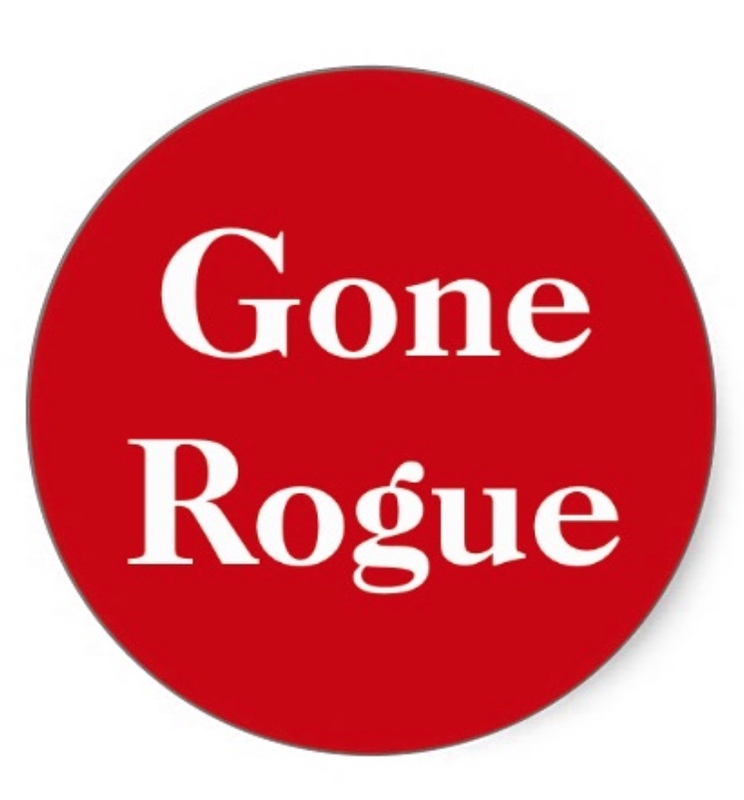 MPO staff, at the highest level, have diminished the credibility of their organization. They bank on and rely on that no one, including any local media, will scrutinize what they do. So yes "It's Time Tampa Bay". But not for the MPO's 2045 rigged planning debacle. It is time to shine a big ray of sunshine on the Hillsborough MPO. And time for the MPO Board members to step up and reign in any overreach by MPO staff.